Clark Goodman, one of our Business Development Coordinators and member of our Local Emergency Preparedness Committee, teamed up with Sarah Dinwiddie with Carilion Clinic and Charlene Vail, the Coordinator of Health Services for Roanoke County Public Schools, to organize our sponsorship of a Stop the Bleed Trauma station in one of our local schools! 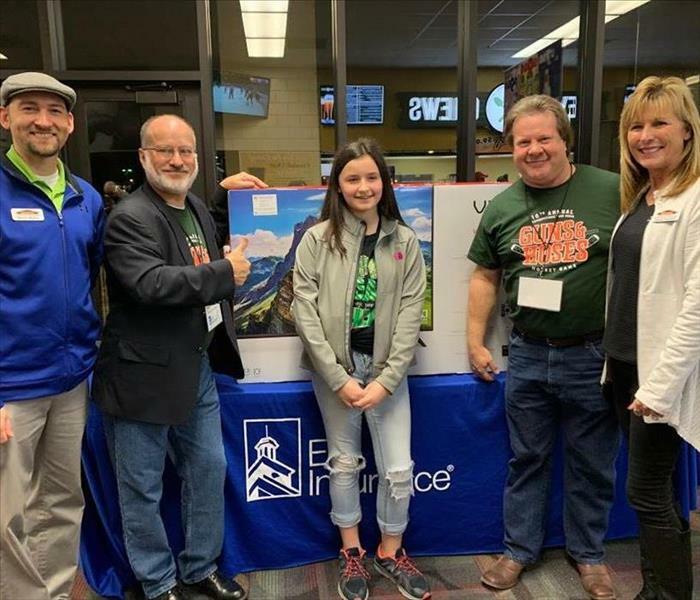 Every year SERVPRO of Montgomery & Pulaski Counties teams up with the Norwinski Insurance Agency to sponsor the Chuck a Puck event at the annual Guns and Hoses Charity Hockey Tournament. This year the lucky winner won a Vizio TV that is pictured above! 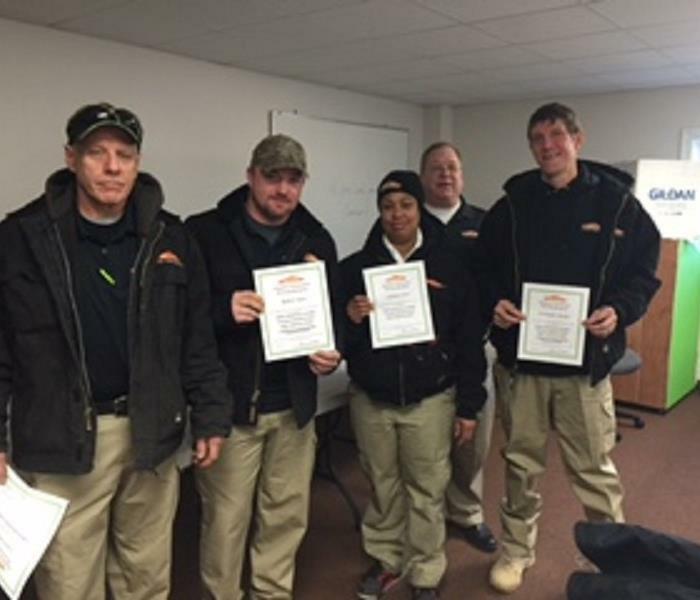 To start off the new year, SERVPRO of Montgomery & Pulaski Counties hosted an IICRC course for Water Damage Restoration at our Salem Facility. Out of the 16 people enrolled in the course, 15 were from our franchise. 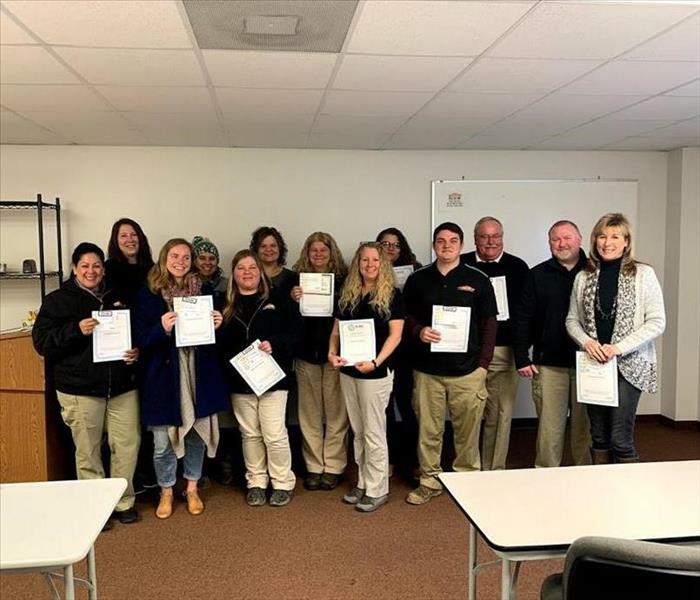 We are proud to say that not only did that course have a 100% pass rate, but our team now has 15 newly certified water damage restoration technicians! We had a lot to celebrate this Tuesday at our weekly morning meeting, and among that was the celebration of 6 of employees celebrating work anniversaries in the month of January. 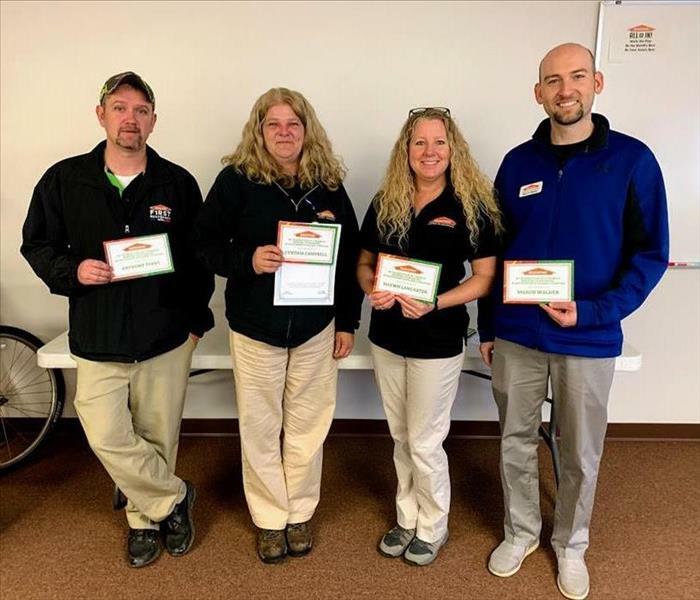 Pictured above from left to right is Tony Terry celebrating 10 years, Cindy Campbell celebrating 3 years, Shawn Lancaster celebrating 1 year, and Mason Walker celebrating 6 years with SERVPRO of Montgomery & Pulaski Counties! Not pictured above is Clare holt celebrating 4 years, and Christian Crawford celebrating 3 years with our franchise! 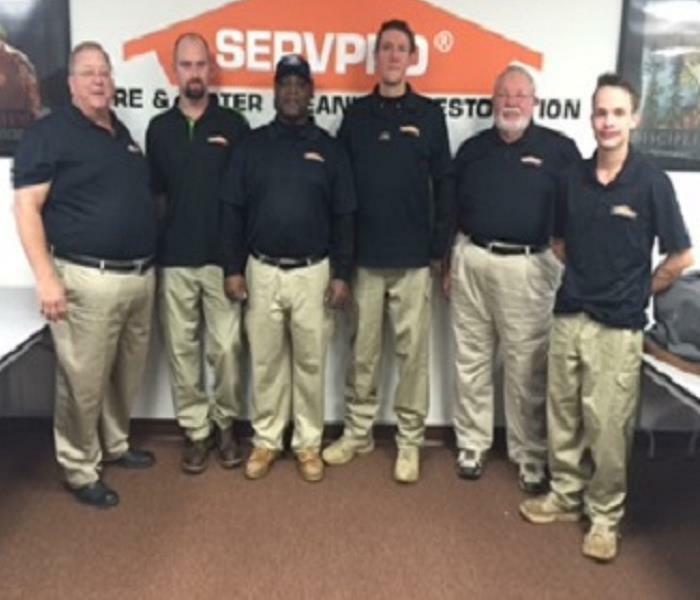 In honor of Martin Luther King Jr. Day, SERVPRO of Montgomery & Pulaski Counties had the day off. About 40 members of the team took the day to all go to the local Rail Yard Dawgs Game together! What a great way to spend a day off! 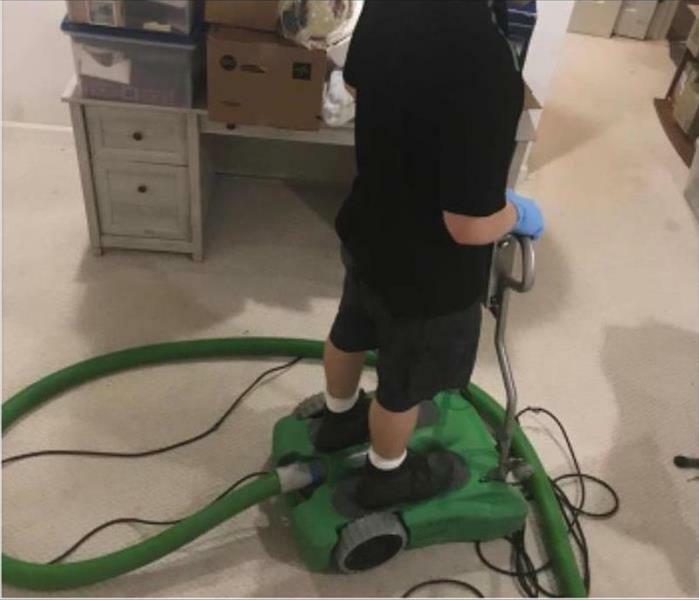 This picture shows the beginning progress of a carpet cleaning on a carpet that had gone through many years of wear and tear. 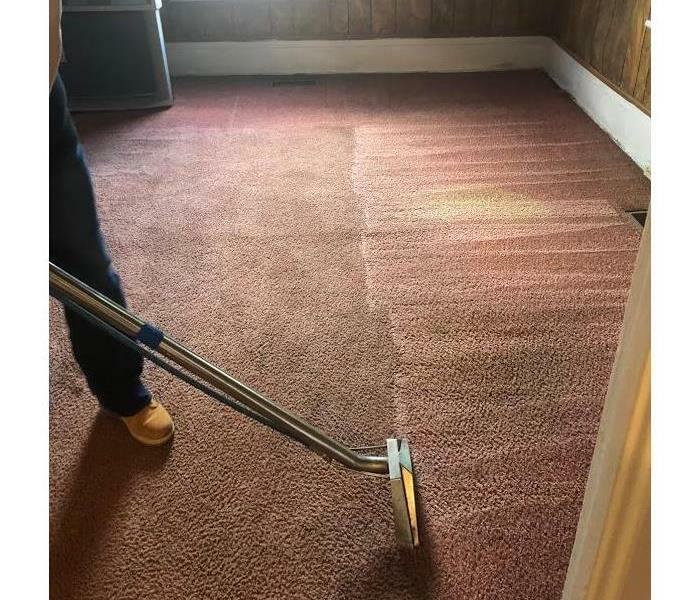 Our carpet cleaning technicians have more processes to go through before the carpet will be finished, but you can see the difference the initial cleaning makes right off the bat! 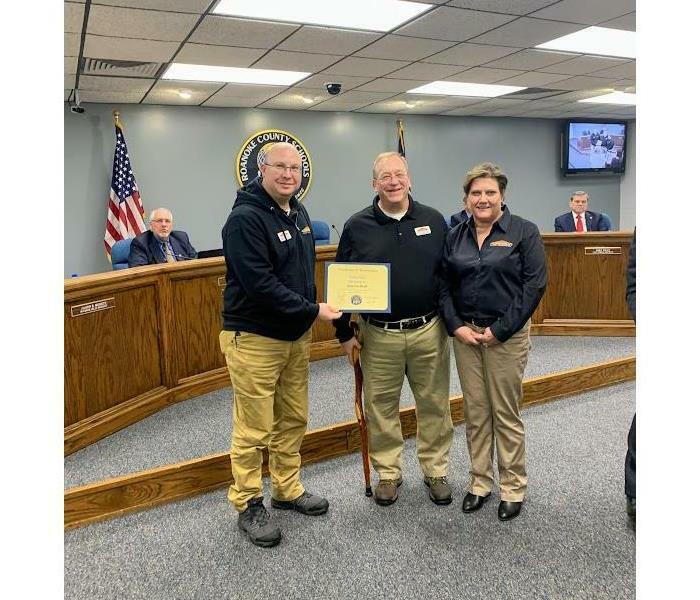 We are proud to announce the owners of SERVPRO of Montgomery & Pulaski County, Lisa and Quinn Mongan, have been honored by the Kiwanis Club of Salem as the Humanitarians of the Year. This award stands, "For Selfless Dedication to Fellow Human Beings in Their Time of Need," and was presented by our own Lisa Bain. 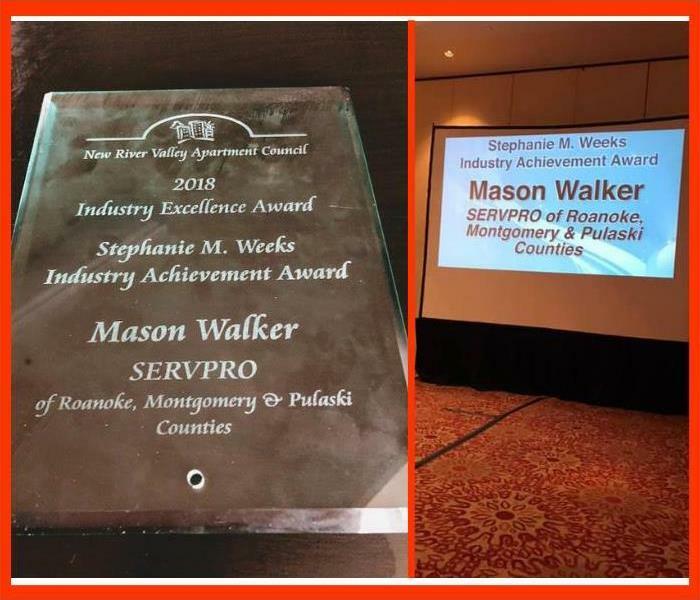 Congratulations to our own Mason Walker for winning the 2018 Industry Excellence Award from the New River Valley Apartment Council! 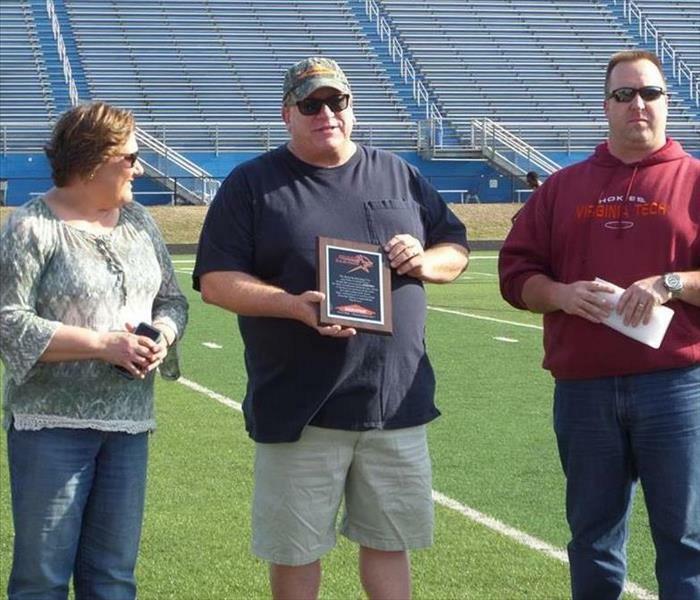 The award was presented by Stephanie M. Weeks with the NRV Apartment Council. Way to go Mason! 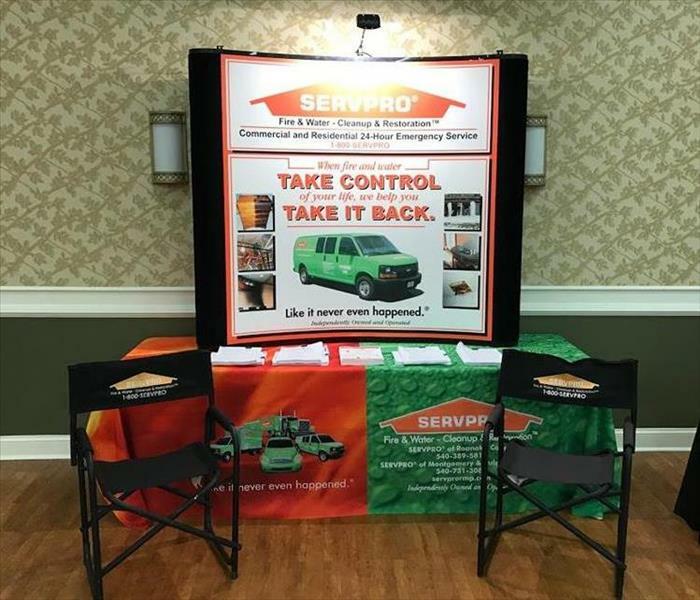 SERVPRO of Montgomery & Pulaski Counties is looking for Production Technicians for our office in Salem. If you or anyone you know is interested, please visit our Careers Page for more information! Following a devastating fire to a local home, there was not much that could be salvaged except for this cherished stuffed unicorn that belonged to one of the children who lived there. 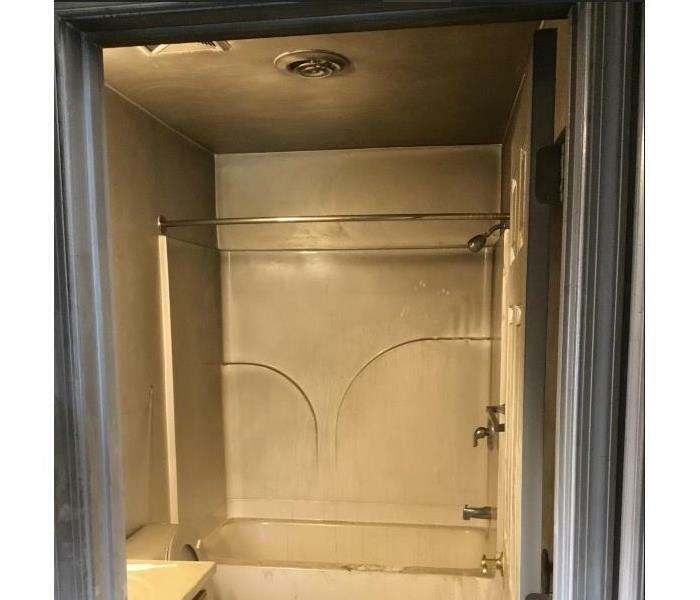 while it was covered with thick soot from the fire, our contents cleaning team was able to make it like brand new so it could be returned to it's rightful owner. We are still seeing the effects of Hurricane Florence, so it is important to stay tuned in to all local news and weather channels for any information of road closures and flash flooding alerts! 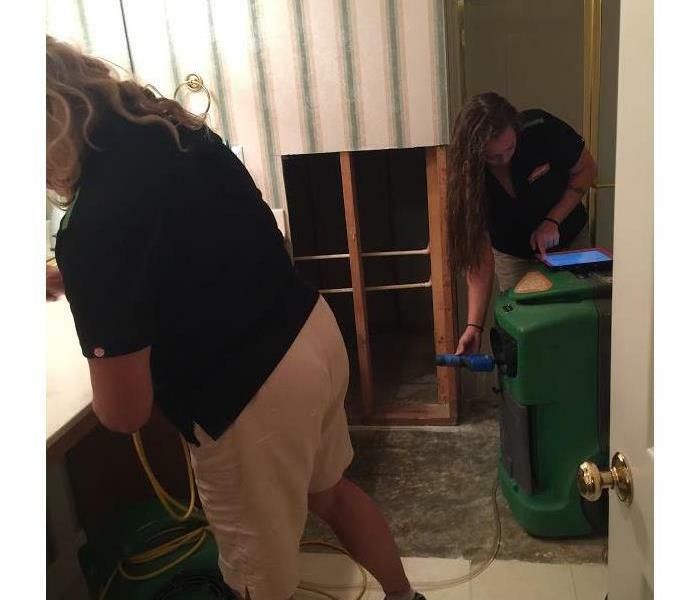 After this home experienced a water damage, Dakota and Cindy were on the job ensuring that no moisture was left behind. This is important for preventing future damage and mold growth. Following a fire damage, it is important that there is a diligent cleaning to get rid of any of the fire and smoke residues throughout the building. If it is not done properly, the unpleasant smell can remain. 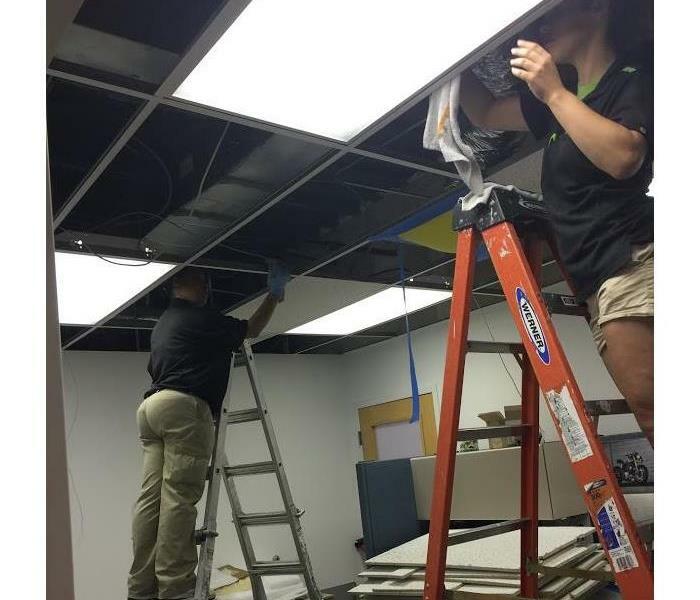 This college art studio is being repurposed for a new program, so they called on SERVPRO of Montgomery & Pulaski Counties to clean up all the thick red clay that was matted on the walls, as well as the red dust that covered the ceiling and walls! This sitting home has been the perfect environment for mold growth for long enough that the mold has spread to almost every room. This home had been left unattended, and there were plants that had started sprouting through the carpeting. After water seeped into the basement of this home, mold growth started to cover the rooms and contents all throughout the lower level. 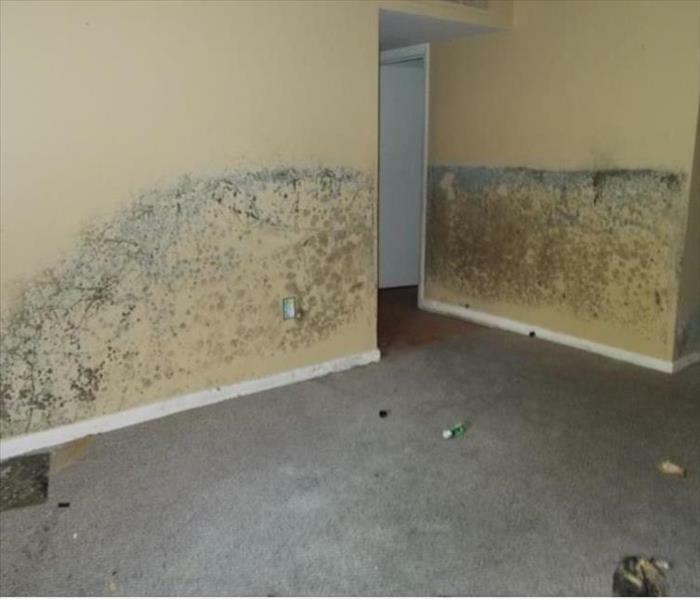 Once mold has an environment where it can grow, it does not take long for it to start to spread rapidly. This damp, cool basement became home to a large spread of mold growth that affected many of the contents within the area. These books are examples of some of the affected contents. After heavy rains consisted for a week straight in our local area, this home's sump pump could no longer keep up with the inflowing water. Pictured is the standing water that needed to be extracted before further damage could occur. After this home experienced a water loss, these wooden floors were left warped and damaged beyond repair. The longer water sits on wooden floors, the harder it is to completely dry them out and salvage them. Here is our team working hard to get all of the excess water in this commercial building extracted. 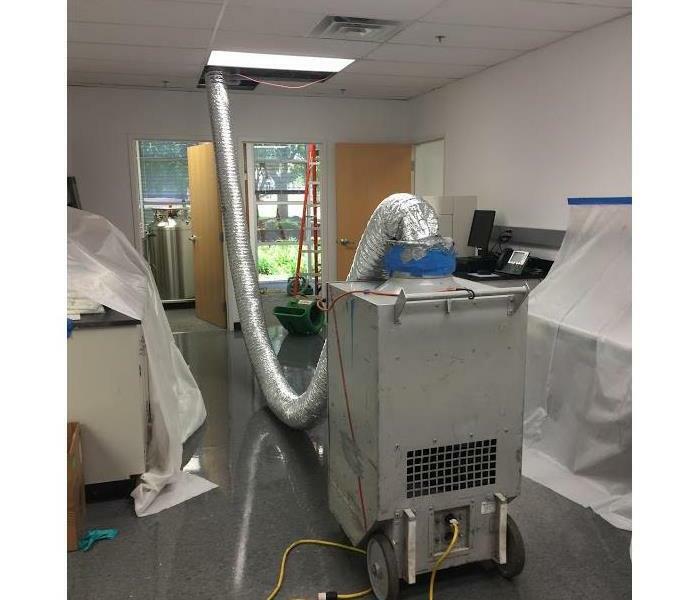 This commercial building suffered this water damage in their storage facility, and they needed it dried up as soon as possible. 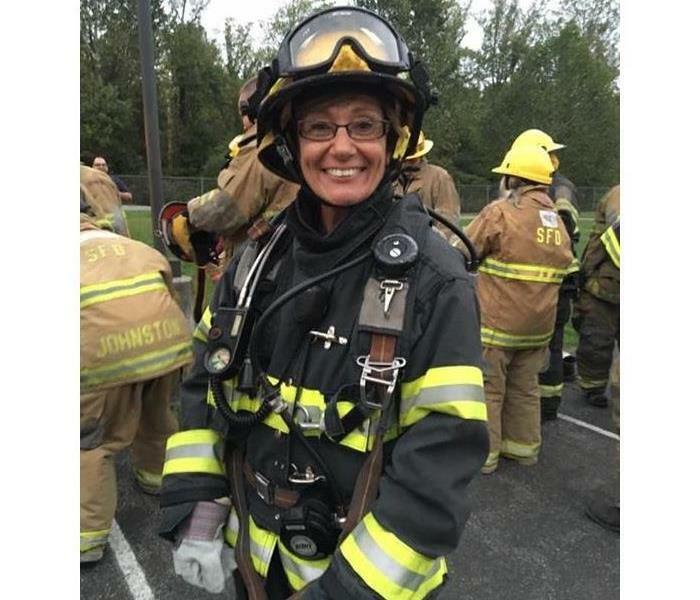 Our own Lisa Bain taught a wonderful continuing education course on the Restorative Drying For Water Damages topic. It was the perfect rainy day to go along with the topic of the class. 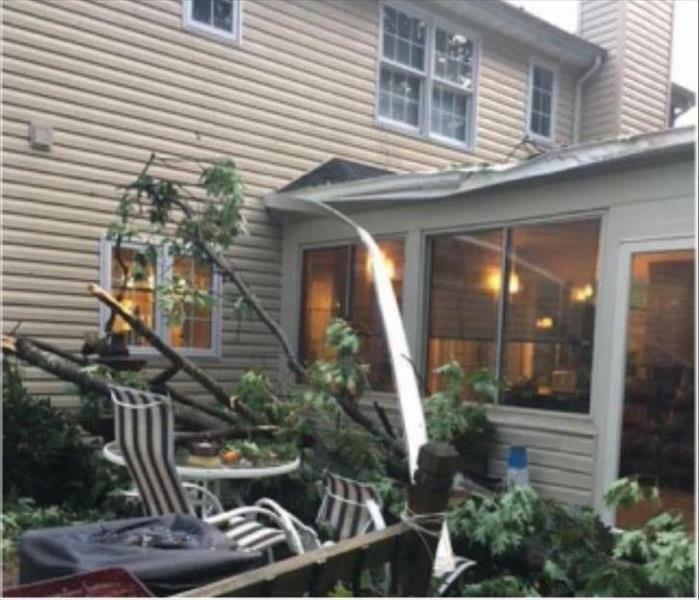 After a severe thunderstorm caused a tree to fall on the back of this local home, water damage seeped inside due to the damage that was done to the roof and siding on the house. After a large storm affected many homes in the area, our team has been working diligently to help take care of all the damages left behind. Here is one of our team members extracting water from a home that experienced flood damage in their basement. Following all the crazy weather and storm we have experienced in the past year, we want you all to know we are here to help! Rain or shine, our teams is always ready to help make your storm damages, "Like it never even happened." After this home experienced a storm with heavy winds in the area, a 100 ft. oak tree was left poking through their ceiling. The damage penetrated the roofing and into the top level bedroom. 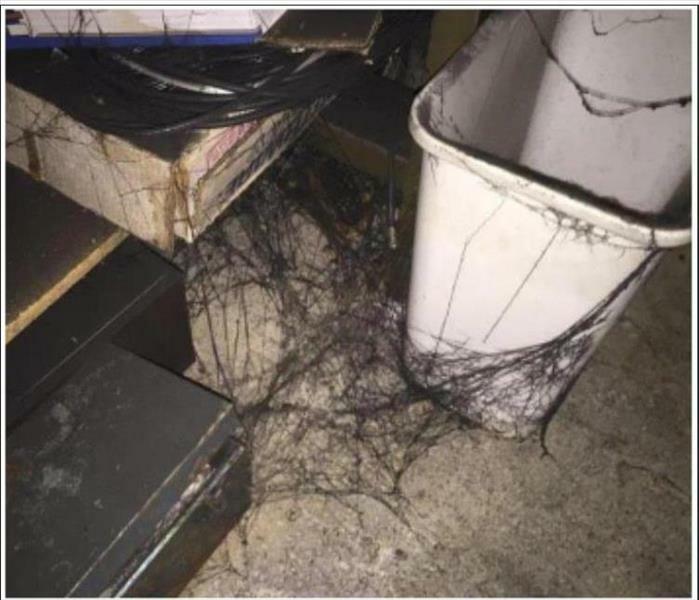 These strange black webs are actually called soot strands. These are commonly left behind following a situation where there is a lot of smoke in a home. They are a fine black particle, mostly composed of carbon, oil, wood, or other fuels. Fires leave behind a thick residue of soot even after they are put out. After this home experienced a fire, they were left with extensive smoke damage throughout the house. 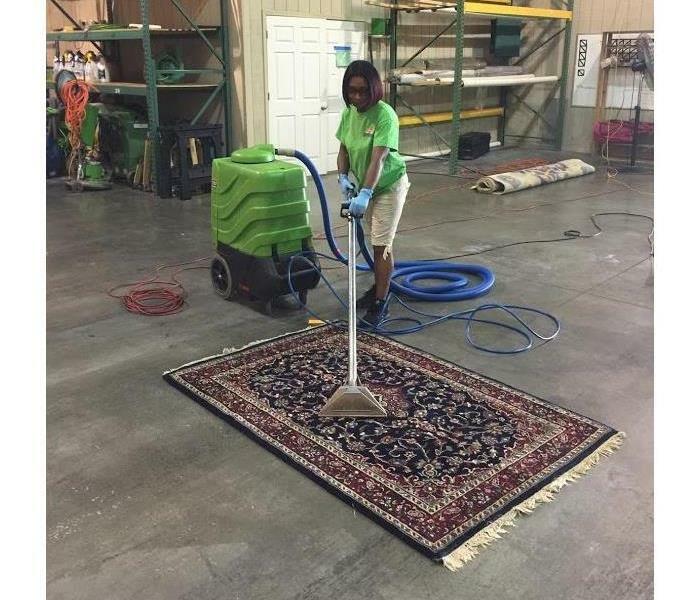 It is important that all the residue gets completely cleaned off of all surfaces, and the air purified to rid of the foul odor that can be left behind. This destructive fire was caused by a cigarette that was improperly disposed of. The fire ripped through the first level of their home leaving everything in it's path affected. 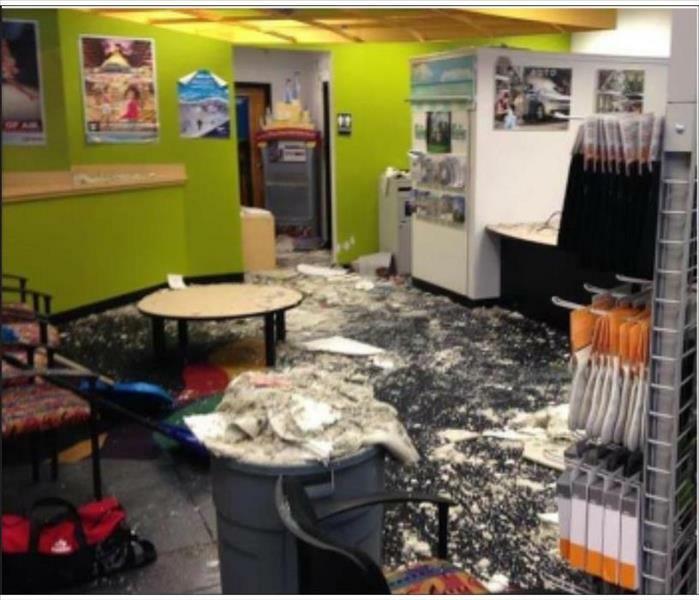 A local business was left with a large mess after they had a water pipe break in their building. 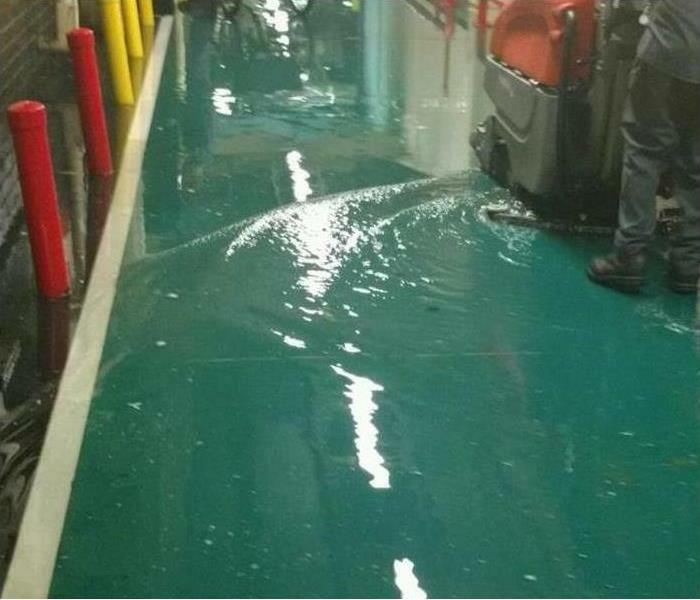 The water sprayed throughout the evening which resulted in their ceiling collapsing in certain areas. 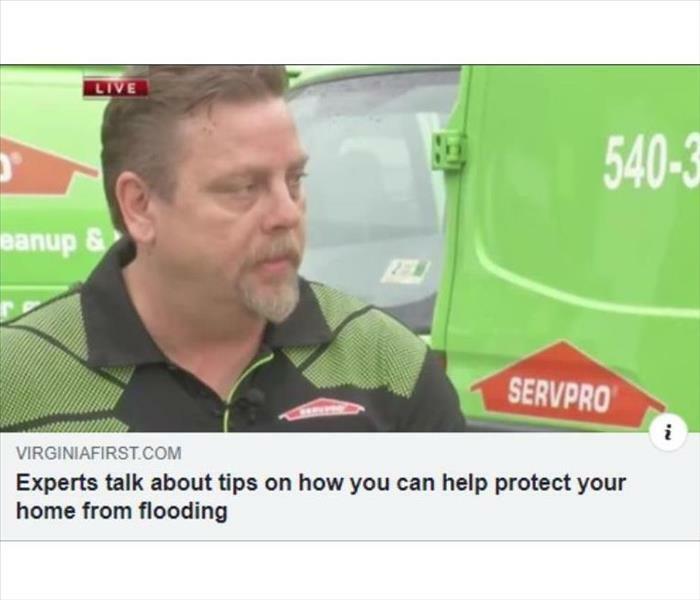 SERVPRO of Montgomery & Pulaski Counties was able to get to the scene within 30 minutes of receiving the call and started extracting the excess water. The faster we can get to a water damage, the more money is saved in damages. Saturday May 5th was a beautiful day for the Roanoke Valley Firefighters Foundation Annual Charity Golf Tournament. Despite the forecast of rain, our team enjoyed a beautiful day of sunshine and golf! 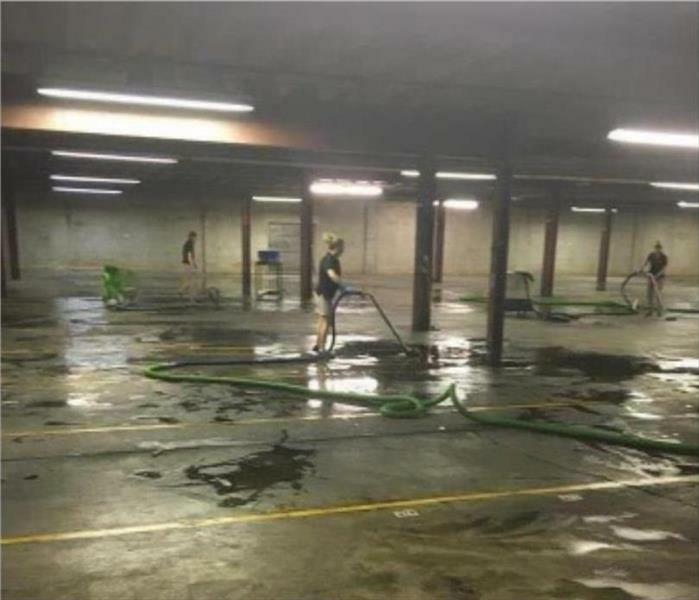 After a commercial business suffered water damage, they were left with a lot of excess water in their warehouse area. 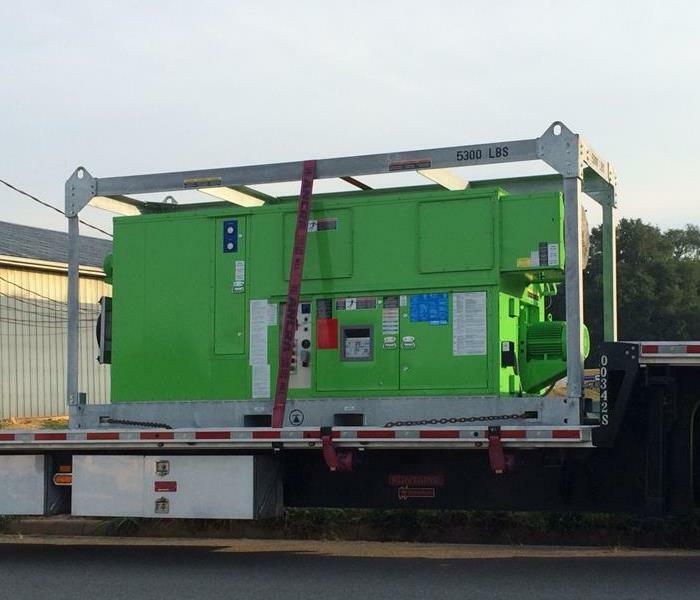 Our team is working to get this company back into their facility as soon as possible! 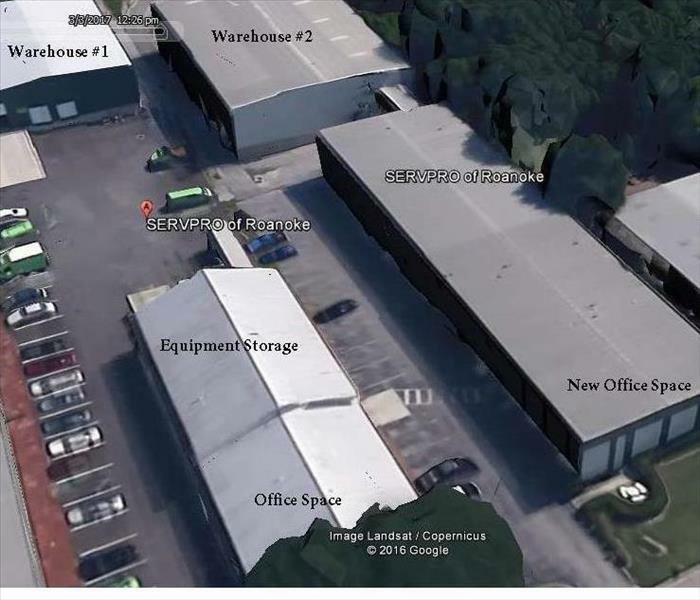 Following an aggressive rainstorm, this local manufacturer was left with a huge mess! The company was in the middle of getting their roof repaired when the storm ran its course. This is our crew midway through a commercial carpet cleaning! There is a clear difference between the section that has been thoroughly cleaned and the section they have not yet reached. Our own Mason Walker teaching a CE course on Understanding Mold in the Restoration Industry at beautiful SpringHill Suites in Roanoke. We were thankful for all those in attendance for our dual class on Mold and Restorative Drying for Water on this rainy day! 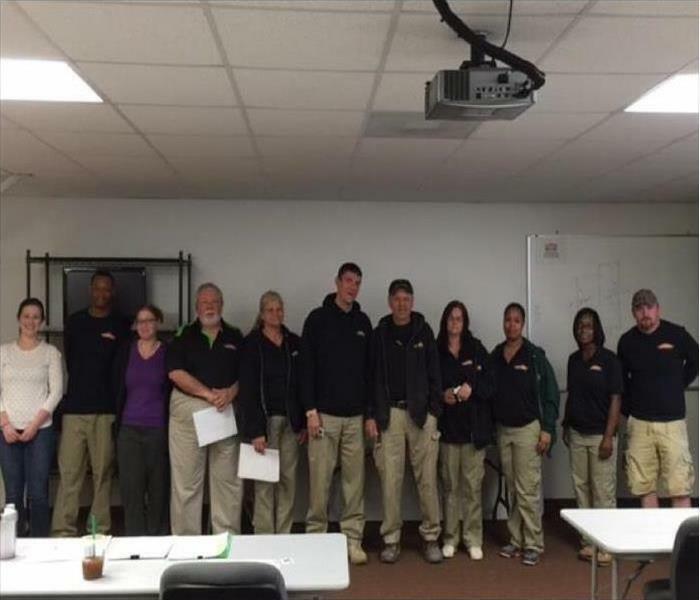 SERVPRO of Montgomery & Pulaski Counties places the highest importance on continuing the education of our dedicated crew members. We want to ensure our staff is the most knowledgeable in the field when it is your home and belongings on the line. 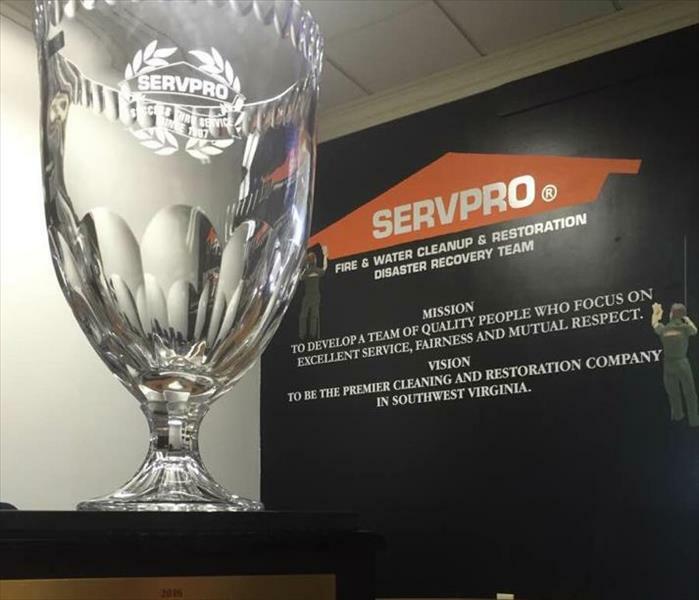 Our ultimate goal as a company is to best serve our customers in their restoration needs and invest in our employees. This is a commitment we take seriously, and a bar we will continue to reach and raise as we grow. 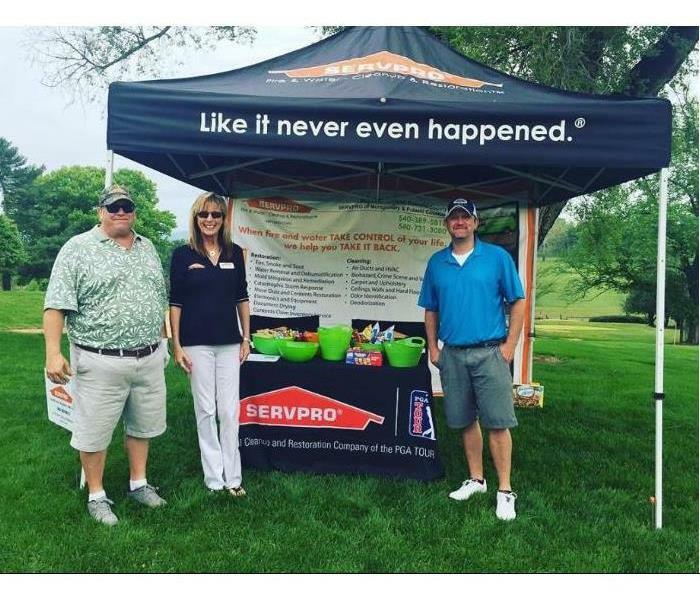 SERVPRO believes in training its crew. 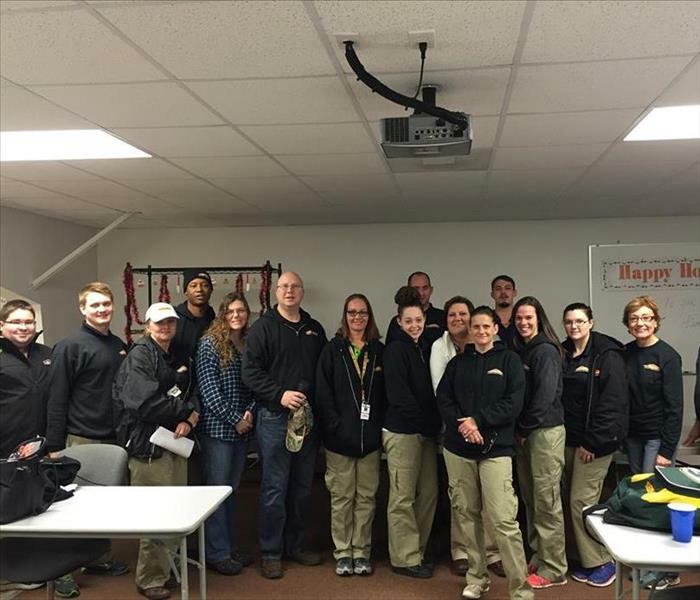 In our 46 seat training facility our crew receives certification training on a regular basis. 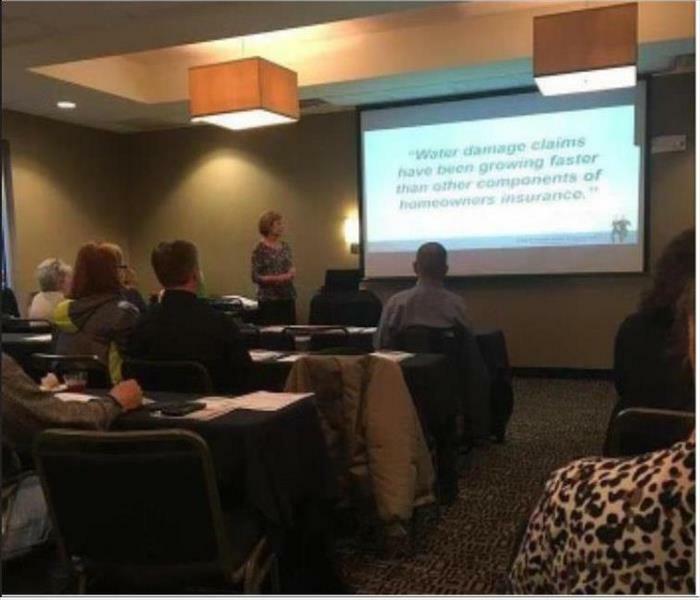 We also offer this room to community groups, as well as provide Continuing Education for Insurance Agents at no cost!